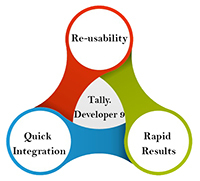 Tally is a need of the hour for working with swiftly business environment. The best way to enhance your business can surely happen with Tally and that’s what Park Business Services is ready to deliver. We come with a package of services for boosting your business performances to lofty heights. Manage your business with Tally.ERP 9 software! Either it is accounting, or invoicing do a hasty work with Tally! Wanting to control multiple works at the same time? Then Tally.Server 9 is all that your business wants. The single platform which allows multiple users to perform seamlessly! Easy navigation is all users need when it comes to operating any software and that can be fulfilled with Tally.Developer 9. Expand your options without limitation with the powerful tool!